Being the most respected organization guided by experienced and knowledgeable professionals, we provide an enormous assortment of Oil Seals. Extensively use in hydraulic & pneumatic systems, and non-automotive applications, the offered oil seal is made under the direction of competent professionals by utilizing optimum grade material and advance machines in accordance with set industry norms. Additionally, this oil seal is properly checked on various quality parameters assuring its flawlessness from our side. 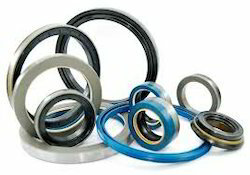 Looking for OIL SEALS INDUSTRIAL & AUTOMOTIVE ?